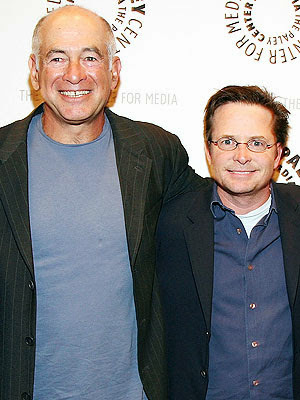 Gary David Goldberg, creator of "Family Ties"
at left, with the show's star Michael J. Fox. His memory was honoured at the recent Emmys. He gave Michael J. Fox his big break, and for that I am eternally grateful. At the recent Emmys, Fox returned the favour by paying tribute to the late Gary David Goldberg. Gary David Goldberg was the creator of "Family Ties", which ran from 1982 to 1989. According to Wikipedia, the show was based on the experiences he shared with his wife and family of hippie parents raising children in the 1970s. When it debuted, it launched the career of a then unknown Canadian actor named Michael J. Fox. The show ran seven seasons, garnering Goldberg an Emmy in 1987 for outstanding writing in a comedy series, for the Family Ties episode: "A, My Name is Alex". It is a two-part episode, centering around Fox's character Alex P. Keaton dealing with the sudden death of a friend in a car accident. "Family Ties" started on peasant vision on Channel 7 CFAC-TV, before migrating to CFCN and that powerhouse Thursday night lineup that also included "Cheers", "The Cosby Show", and "Night Court". "Family Ties" was not just a vehicle for Michael J. Fox. It had a strong cast that included Steven Gross as patriarch Steven Keaton and Meredith Baxter as matriarch Elyse Keaton. The show was funny and tackled some serious subjects. Goldberg was the creative driving force. "Family Ties" and all his shows were punctuated by that same clip in the end credits. It was a picture of a dog with the voice over, "Sit Ubu sit. Good dog." That was the signature for Goldberg's production company Ubu Productions, named after his dog. Goldberg would go on to create the semi-biographical series "Brooklyn Bridge" from 1991 to 1993, and starring Marion Ross, most famous for her role as Marion Cunningham in "Happy Days". Goldberg would also reunite with Michael J. Fox in 1996 to create "Spin City", which ran until 2002. Sadly, Gary David Goldberg, and that fertile mind for comedy, died of brain cancer on June 23, 2013, at the age of 68. Rest in piece. Hopefully, Ubu was there by your side.